1.7 KM TO APPA JN. 1.8 KM TO ORR. 13 KM TO AIRPORT. 12 KM TO GACHIBOWLI. 5 ACERS LAND-7 BLOCKS. 10 TO 12 FLATS IN EACH FLOOR. READY TO OCCUPY. 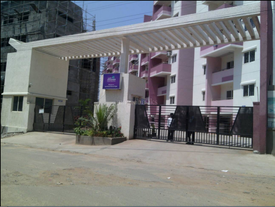 2, 2.5, 3 BHK FLATS AVAILABLE. 950 SFT TO 1250 SFT--EAST AND WEST FACINGS.